According to AAA, a whole lot of people are expected to travel this holiday season, with about 5.7 million of those people choosing air as their primary form of travel. As someone who is up in the air a lot (in fact, I’m on my 81st flight this year as I write this), I have a bit of advice on how to not be that annoying passenger and piss off your fellow air travelers. I’ve been thinking of writing a post like this for a while and my flight from SEA to DTW inspired me to write it on the flight, because, well, holiday travelers were everywhere today. Yeah, we can all agree that the 3-1-1 rule is stupid, but it’s a rule. And it’s there to follow. So, follow it, OK? Oh, and skip the prohibited items, too. This year I’ve seen a woman who brought cans of Raid in her carry on, a man that tried to bring a meat cleaver through security, and a family flip out because they couldn’t bring juice through the gates. I get it, it’s the holidays, you don’t travel much – but that’s why you check the guidelines. The rest of the people in line behind you don’t want to wait while you freak out, then complain, then step out to ship your item, etc. You’re unpreparedness is annoying the rest of us. Again, I get it, it’s the holidays. You don’t go to the airport often and you’re trying to find the next sign to point you in the correct direction – and I support that. Just move like 20 steps away from the escalator. I actually witnessed someone fall at DTW when the person behind her (with luggage) ran right into her as the escalator didn’t stop just because she stopped. By the way, this also applies to moving walkways. I fly Delta which boards by the following zones: Passengers needing extra help, First Class, Sky Priority (meaning you have status), Zone 1 and so on. Most airlines have a similar policy. If you’re on the back of the plane and don’t have status, you’re not getting on for a bit (and you’re bag is probably not going in the overhead). Just chill, wait, and again prepare for this scenario as you may be forced to check your bag. Maybe you had a red eye, maybe you’re a smoker, or guzzle coffee like it’s your job. 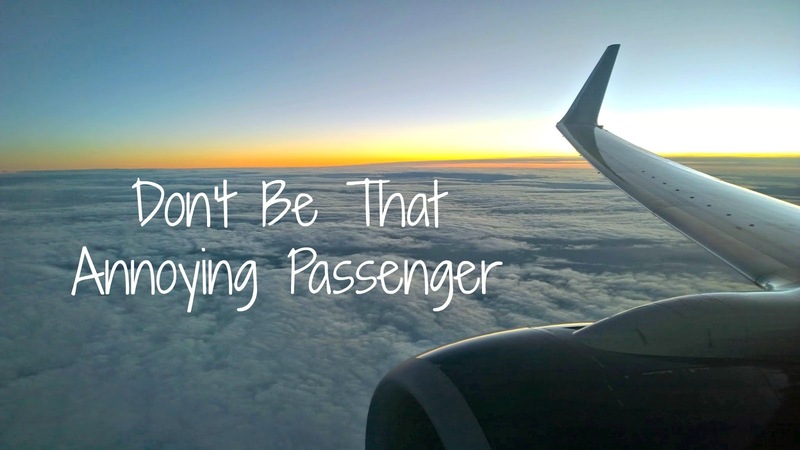 You may have no awareness of your breath, but you can bet your fellow passengers do. Bad breath travels quite far in the stale air of the plane and it is awful. If you’re flying, be extra sensitive and just pop a mint every now and then. And if I offer you a mint – TAKE IT. It’s not because I’m into sharing, it’s because you need it. Seriously, headphones are so cheap now. You can get decent noise-canceling earbuds for like $8. If I can hear what you’re listening to, you are listening to it way too loud (potentially causing hearing damage) and annoying the people around you that are trying to read and/or write or whatever they want to do without hearing you watch Family Guy reruns on Dish! The where are you flying today small talk is perfectly friendly, but please don’t dig deeper. I’ve had people ask me the most random questions on flights, like how much money do I make? Lately, when they find out I fly a lot, it’s, “But don’t you want to get married and have a family? You’ll never settle down if you’re always flying.” I wish this were a one off but I’d guess I’ve been asked that 10 times this year (mostly by women). This also goes for laptops/tablets. If you see something on my screen, it doesn’t give you carte blanche to talk to me about it. Especially if it’s work related. What’s the first thing you do when the plane lands? Turn on your phone, right? Well, everyone else does, too. And surely you have Facebook/Twitter/CandyCrush/Text/Whatever notifications and because you have your volume on high, I know all about your notifications, too. We don’t need to hear literally thousands of alerts all at once. Just put it on vibrate before you take off. This may be the most important point of this whole post. Your flight is delayed, it’s snowing, you’re already getting yelled at by your crazy family members that want to know exactly what time you are going to arrive (when you don’t know, because your flight is delayed). All of those things can drive you insane and lead you to misplacing your anger on your customer service agent. Well, don’t. In fact, go one step further. Be nice. Wish your gate agent a happy holiday. Say hello to your flight attendant. Thank your captain after your flight. Say hello to your seatmate (even if you never intend to speak to them again). Everyone is tired, everyone is overwhelmed, and sometimes a simple smile and a kind word can go much further than you could ever imagine. And, take it from my experience of dealing with many canceled flights, when your flight is canceled or there is an issue, a simple, “Hi, I really appreciate you helping me. What can we do to get me home today?” is much more likely to work than telling the gate agent how angry you are, or saying rude comments. I am sure there are a million other things that can annoy passengers (I’m sure I do some annoying things, too). Leave me a comment and let me know what annoys you about other travelers. I realize airline seats are small, however, that does not give you the right to occupy my space along with your own. Be mindful of staying in your own seat space. The includes arms and legs! And don't fall asleep on my shoulder – ever. Yes! That one gets me, too. I'm always aware of my space and try really hard not to invade my seatmates space.